When you have a kid who loves logic and problem-solving but claims to hate reading, detective stories seem like a perfect solution. Happily, not only did my reluctant reader dig the adventures of Encyclopedia Brown, Boy Detective, so did the rest of us. Leroy Brown picked up his nickname because of his encyclopedia ability to recall information. At home at the family dinner table, Encyclopedia weighs in on his police chief dad’s cases, often spotting clues the Idaville police force has missed. After school, Encyclopedia takes cases from the neighborhood kids (many time involving the antics of local bully Bugs Meany) for $0.25 a day plus expenses. 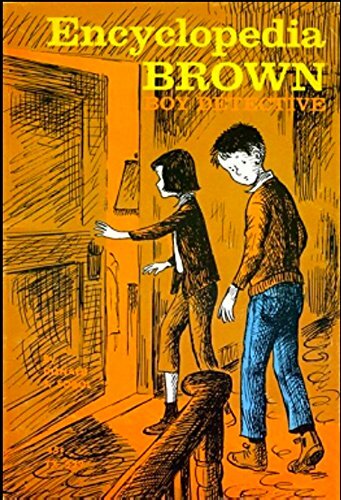 The real fun, though, is that each story ends with a question, prompting the reader to try to solve the mystery before flipping to the end of the book to find out if his guess is as good as Encyclopedia Brown’s. Some clues went over our heads (I can’t say I am familiar with the velocity difference between cooked and uncooked eggs), but when we were able to piece together the clues and figure out the right answer, it was always thrilling. Because each of the stories is just a few pages, this is an easy readaloud to squeeze into those weeks where you’re super-busy. The short stories are also appealing to reluctant readers, who may be tempted to read “just one more” on their own. The Encyclopedia Brown series was written in the 1960s, and there are definitely parts that feel dated. No one could call the book feminist, and the characters are a homogenous lot. In spite of that, this first entry in the series makes a fun readaloud, though, that makes a great gateway to other fictional detectives, including Sherlock Holmes and Hercule Poirot.